A couple of weeks ago I was at the supermarket doing my general shop when I noticed out of the corner of my eye that there was rhubarb for sale. Given that it is not in the shops very often I do notice it when it is there, but on that occasion I passed on by because I don't often make desserts when it is just the two of us. Fast forward a week, I impulsively invited a friend around for dinner, and that gave me the excuse I needed to do something rhubarby (even though I know full well he isn't a dessert kind of person). However, I didn't want to make crumble or pie so I went searching for a recipe for a rhubarb cake, and I have to say this one was a winner, and the other people who ate it agreed too. The good thing was this was good served either slightly warmed up with custard or cream and also cold! Gotta love a versatile dish! Speaking of versatile, I found this recipe over at Taste.com.au and in the comments people mentioned using the base recipe but substituting the rhubarb with other types of fruit including apples and blackberries among others. I am thinking of trying it with blueberries at some point. Preheat oven to 160°C. Lightly grease a 24cm springform pan. Line base and sides with paper, extending paper 3cm above top of pan. Beat butter, sugar, vanilla and zest with an electric mixer until well combined. Add eggs one at a time, beating well after each addition. Fold in sifted dry ingredients and cream in two batches. Fold in rhubarb. Spread mixture into prepared pan and sprinkle evenly with combined extra sugar and cinnamon. 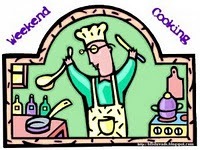 Cook for about 1 hour 15 minutes, or until cooked when tested with a skewer. Cover top with foil if sugar starts to over brown. Remove cake from pan and cool on wire rack. Cake is delicious served warm or cold with custard or cream. OMG, with the sour cream, cinnamon, and lemon zest, you can't go wrong. Rhubarb is long gone here, but we're in the heart of peach season. I may have to bake next week. Oh, that would be delicious! That beautiful cake is making me hungry. I am kind of wishing I had some left at the moment. Oh, yum - I love rhubarb. What a delicious cake. Definitely delicious. Some days I am glad that rhubarb is only available for a short time so it stays a treat but others days I wish it was available year round! I found some people to share it with, but you are quite right, you could eat the whole thing...especially if you varied the combinations every times - sometimes hot, sometimes cold, with custard, without custard. So many options. Sour cream in a cake always sounds like a guarantee of moist, delicious dessert. YUM. I have made a couple of different sour cream cakes now and they were both delicious. Rhubarb/Strawberry jam sounds delicious too! I am not a dessert eater, but this could change my mind -- it looks beautiful! Neither was my guest, but he liked it too. Yum, and it would be great with custard! Indeed, and it doesn't really matter if you serve it warm with custard or cold with custard. Good both ways! I'm not a rhubarb lover, but the cake does look and sound really good! I love rhubarb and this cake looks delicious! I am almost tempted to try another rhubarb recipe this weekend. I love rhubarb. This sounds good and easy to make. 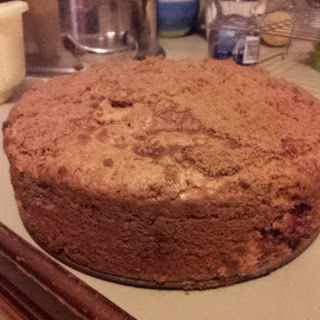 Mystery Lover's Kitchen had a plum cake recipe up yesterday that looked good too. Plum cake sounds good too!